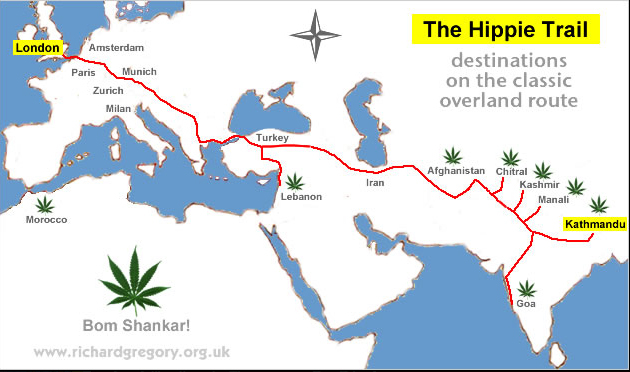 "This is not the end, Just the beginning"
If there's one aspect of Turkey that we don't talk about much these days, its the country's former importance as the starting point of the Hippie Trail. 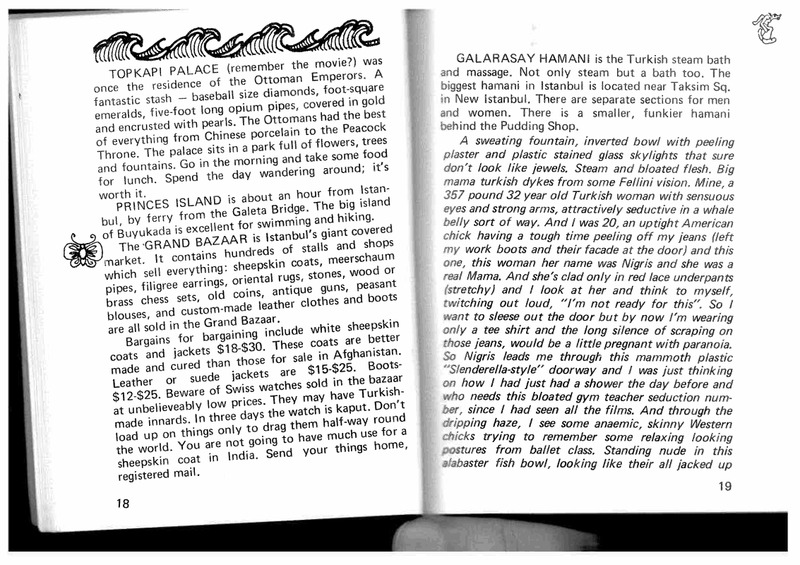 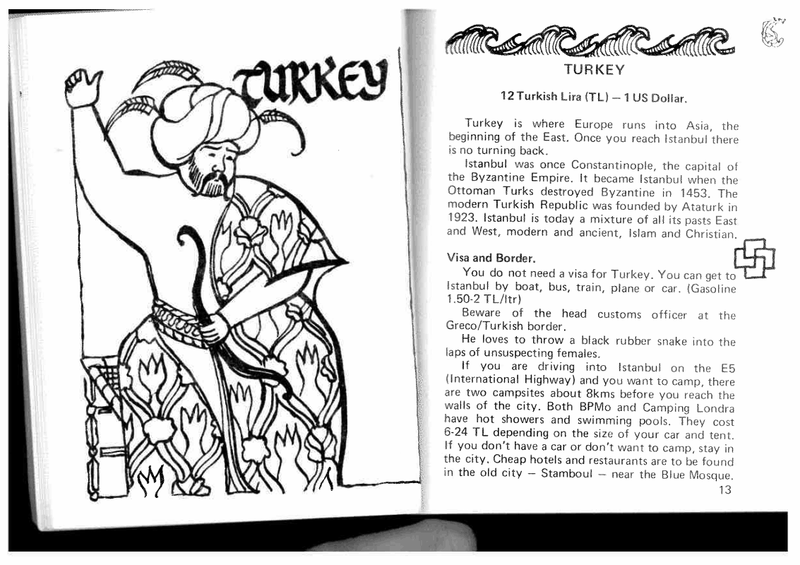 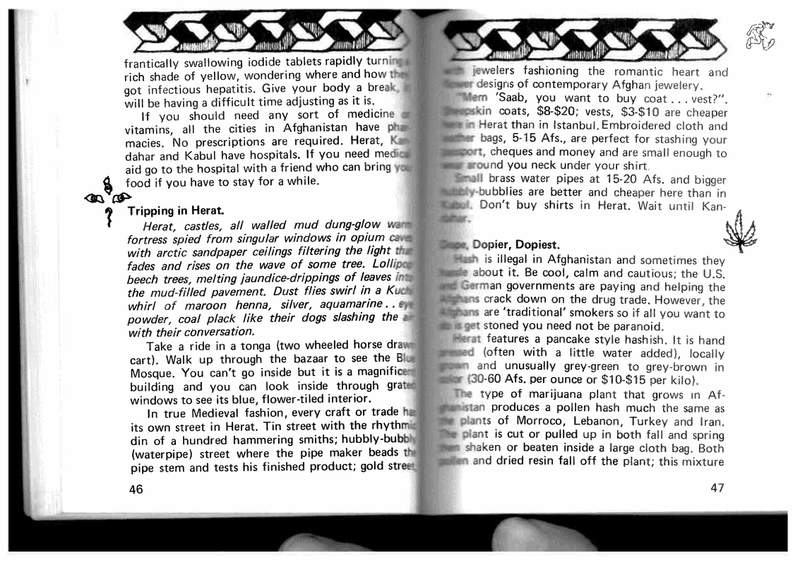 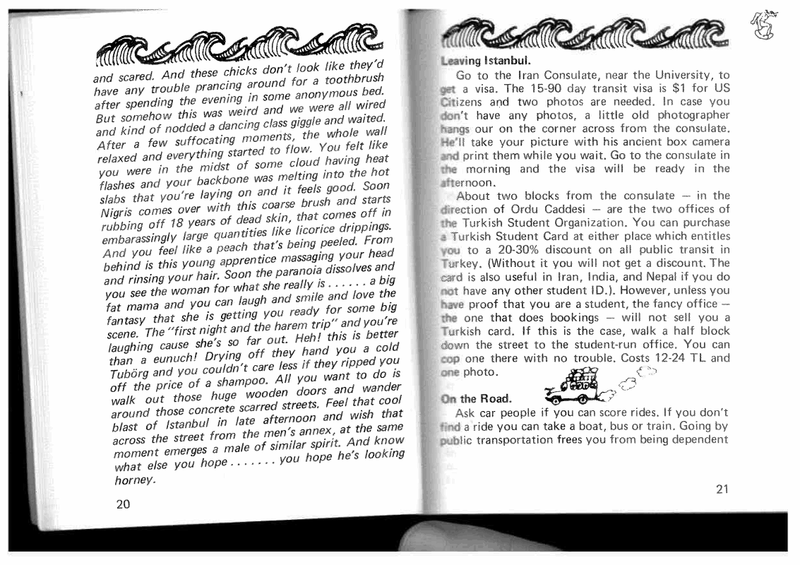 Among other things, hippies get an excellent entry in Reşat Ekrem Koçu's Istanbul Encyclopedia, complete with a drawing, a whimsical poem, and a bit making fun of religious men who taunted the hippies in Sultanahmet by day, then returned to try to pick up hippie women by night. 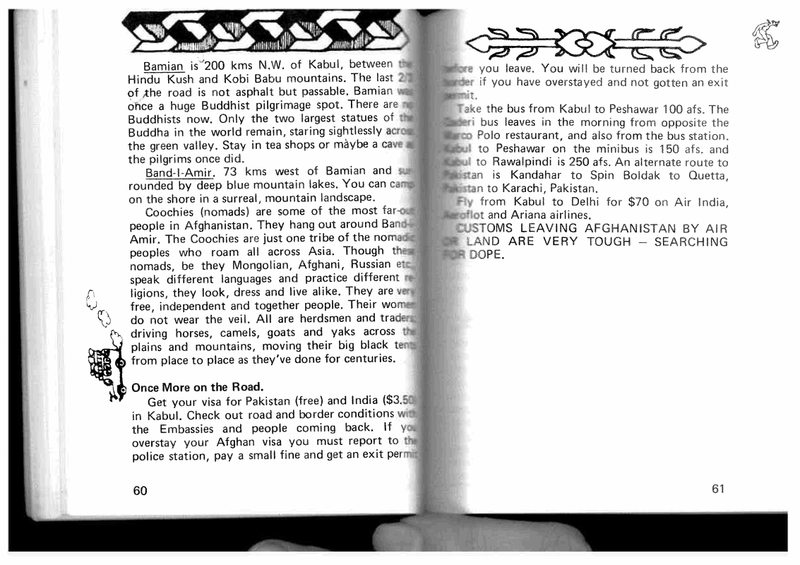 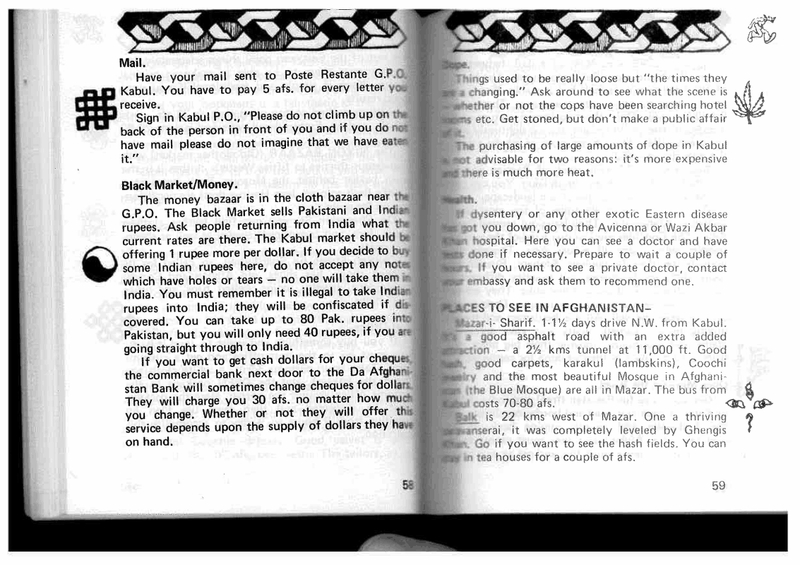 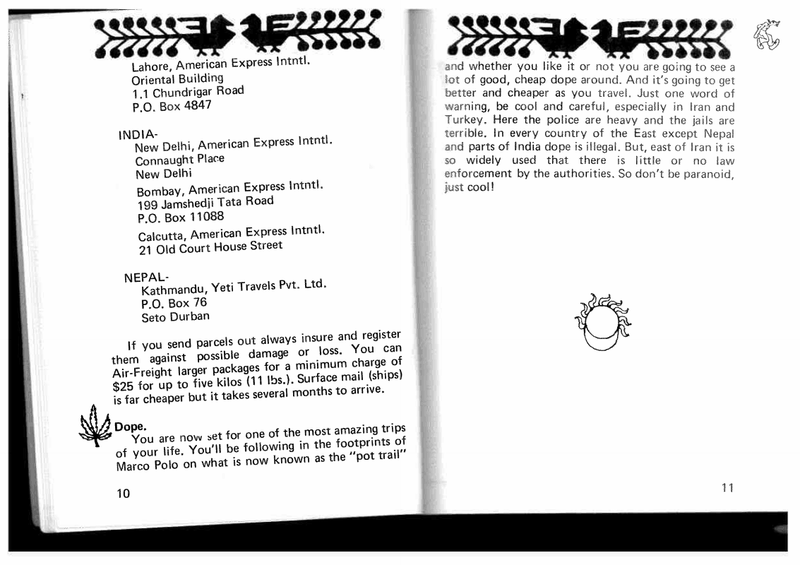 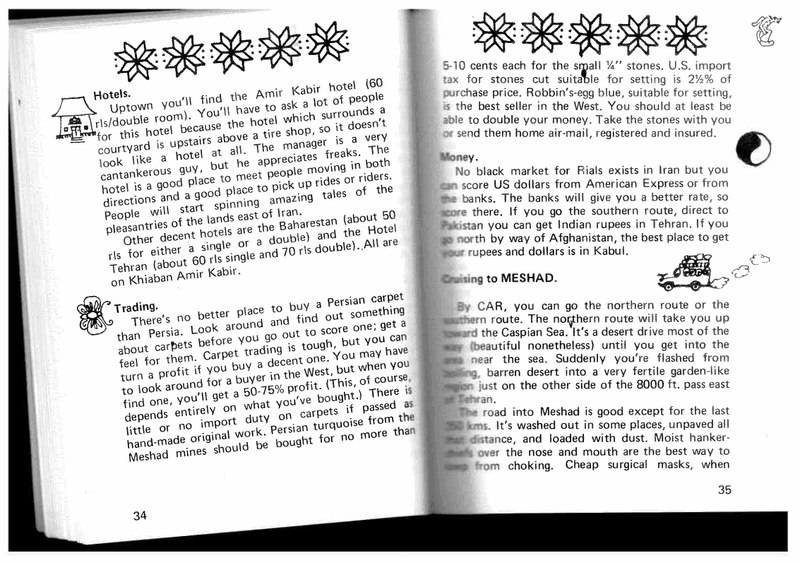 It's proved surprisingly hard to find good maps of the hippie trail, which I'm sure must have existed. 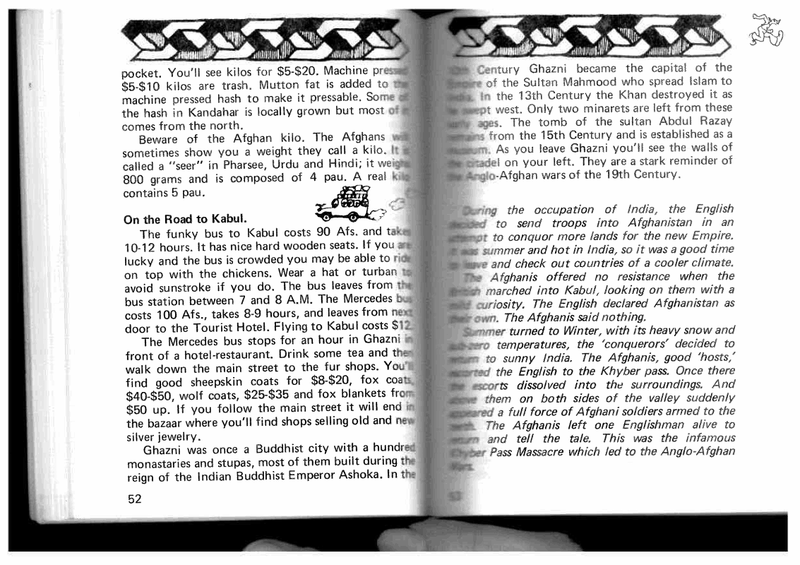 There's this way too computer-designed looking map from Richard Gregory's The Hippie Trail 1974, as well as the inevitably competent wikipedia map. 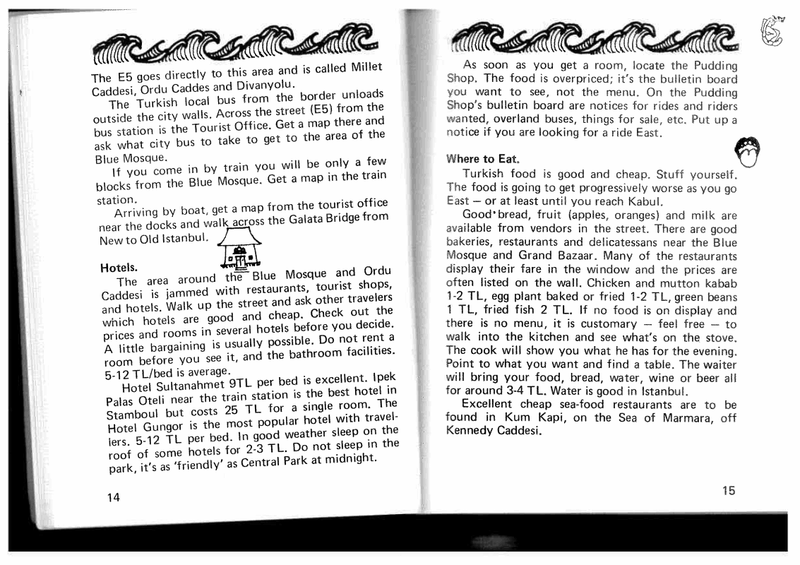 There is also this old bus route and another bus-themed graphic from an article about the Cruise of the Indiaman. 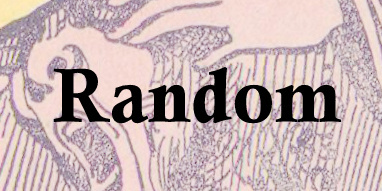 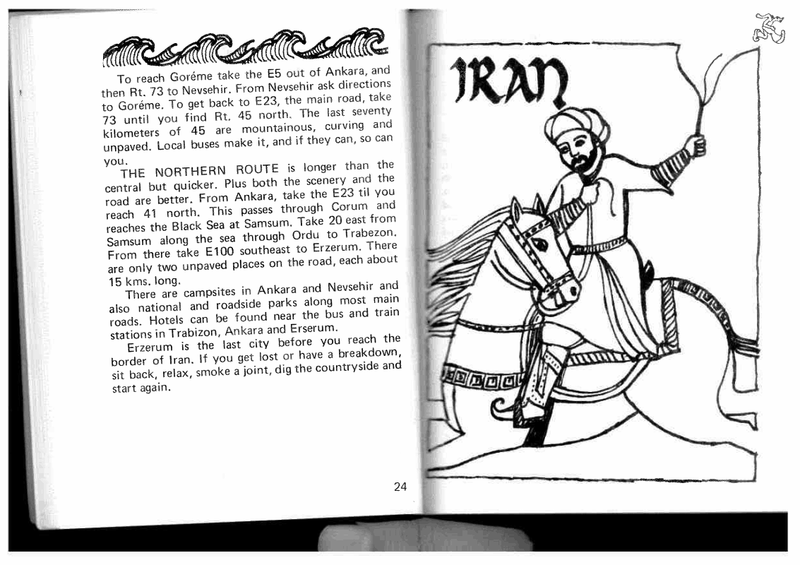 The best thing available online is probably this map (detail), from this guy, who also includes some other great pictures from his 1978 trip. 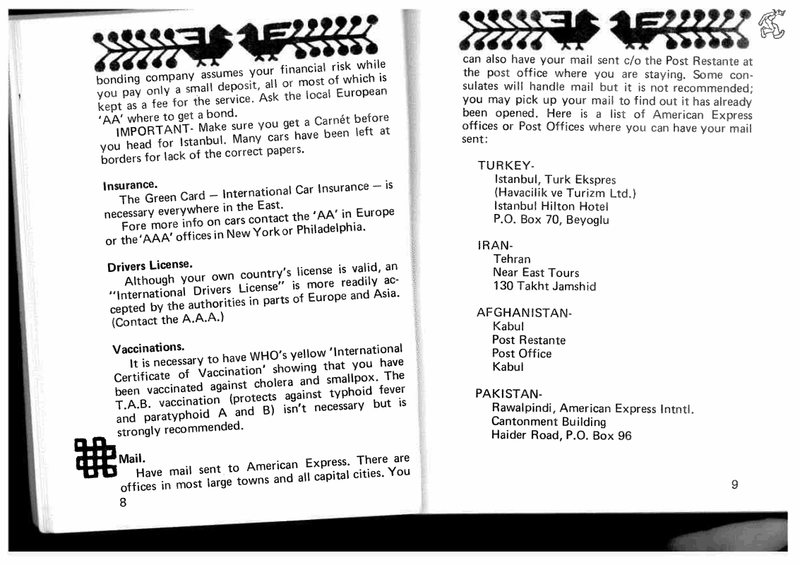 In any case if any of our readers have maps lying around they should send in a copy. 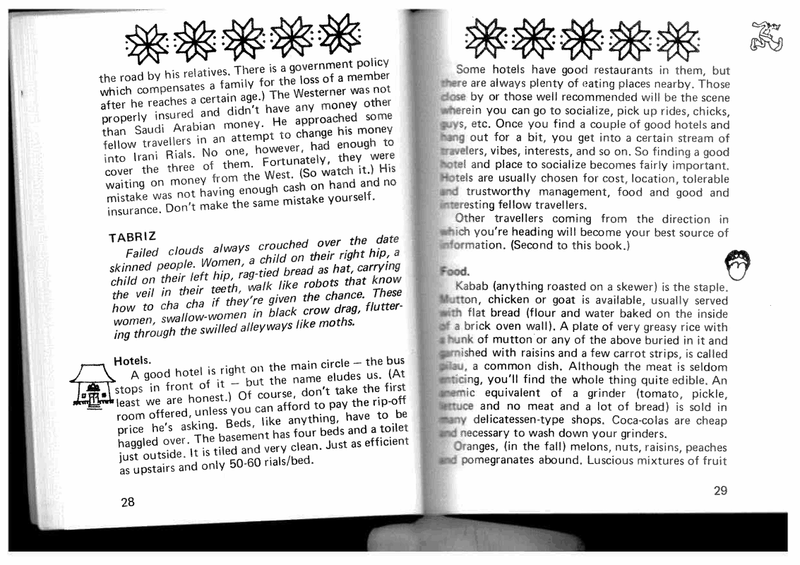 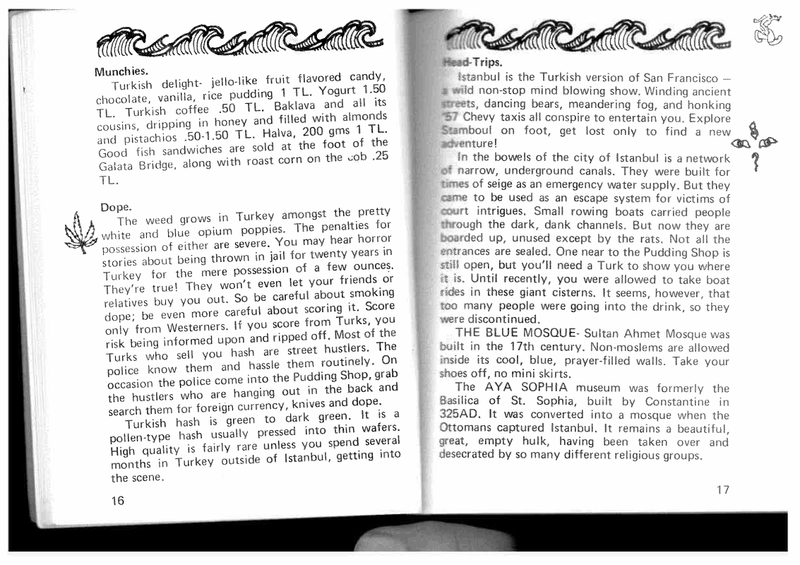 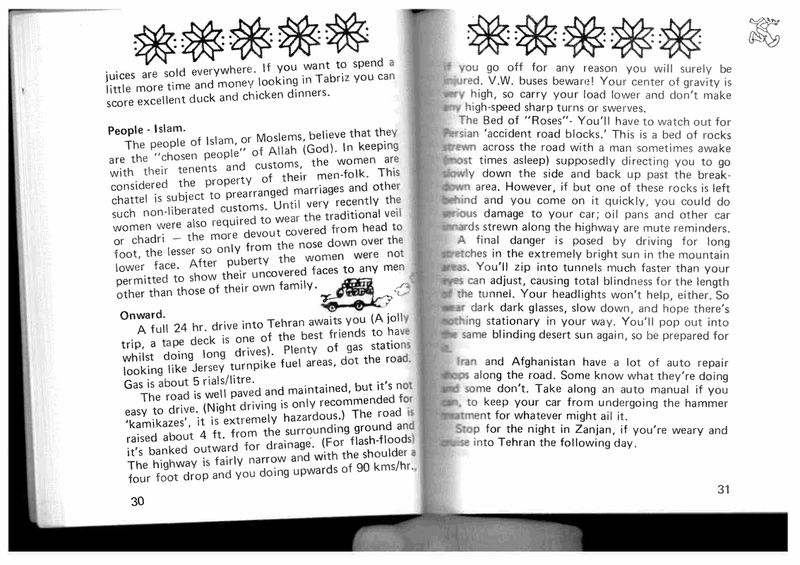 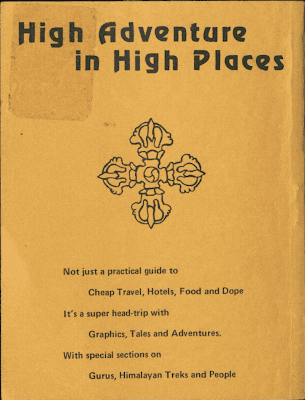 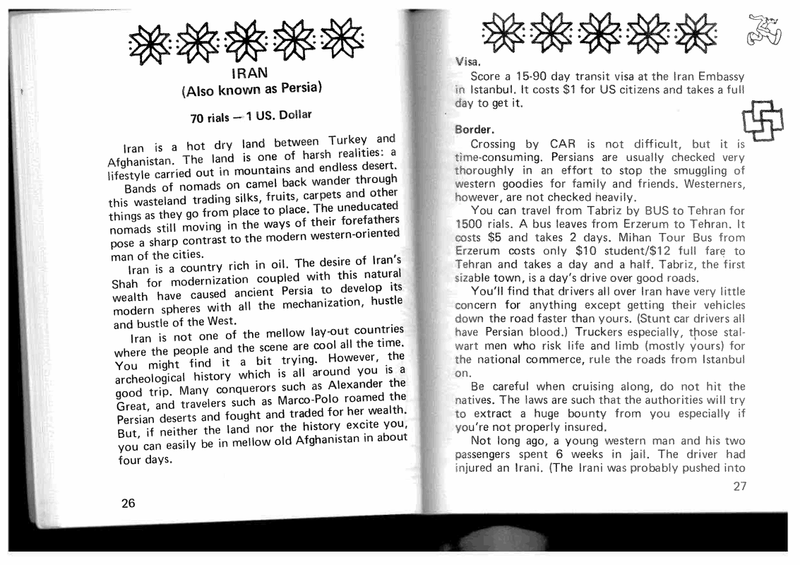 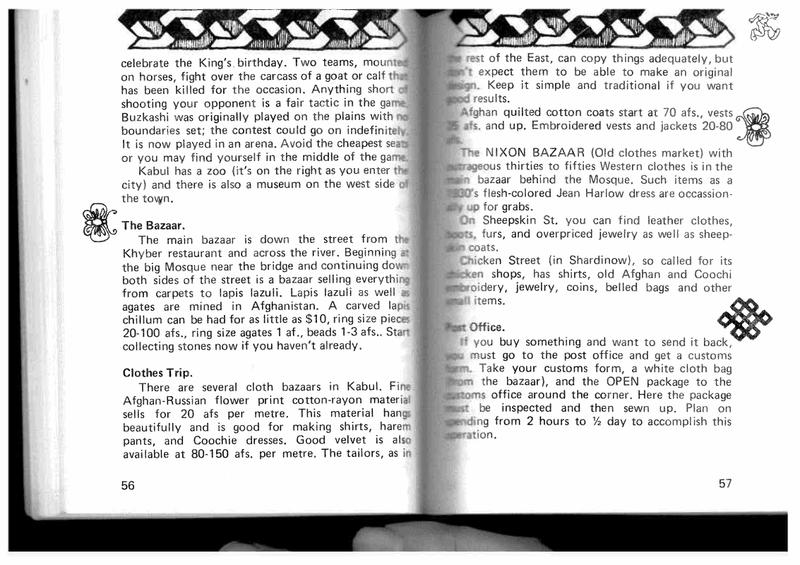 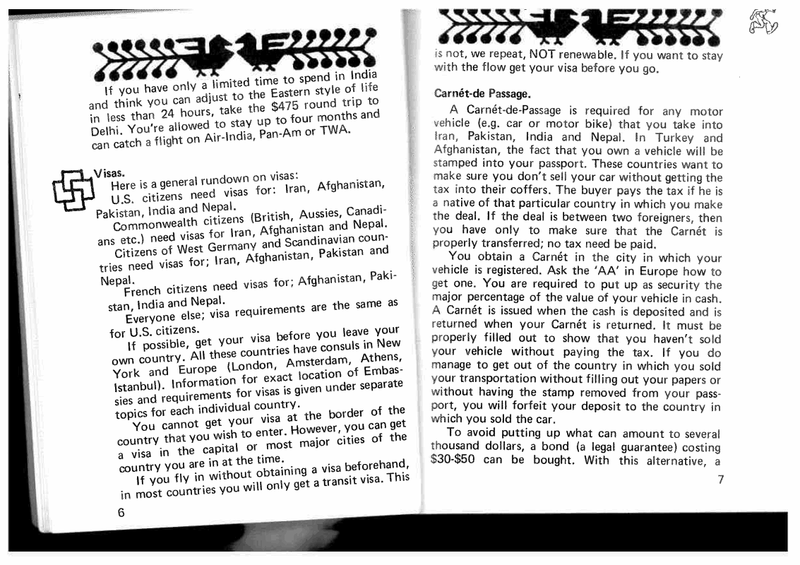 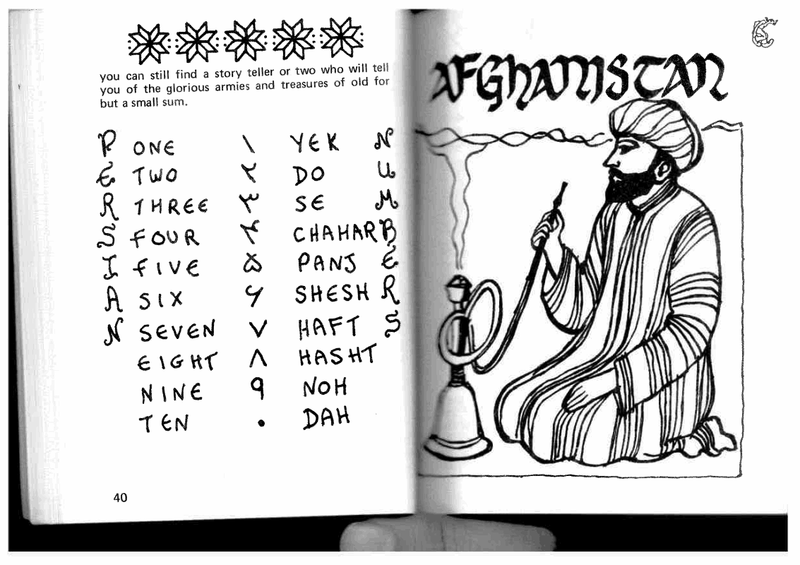 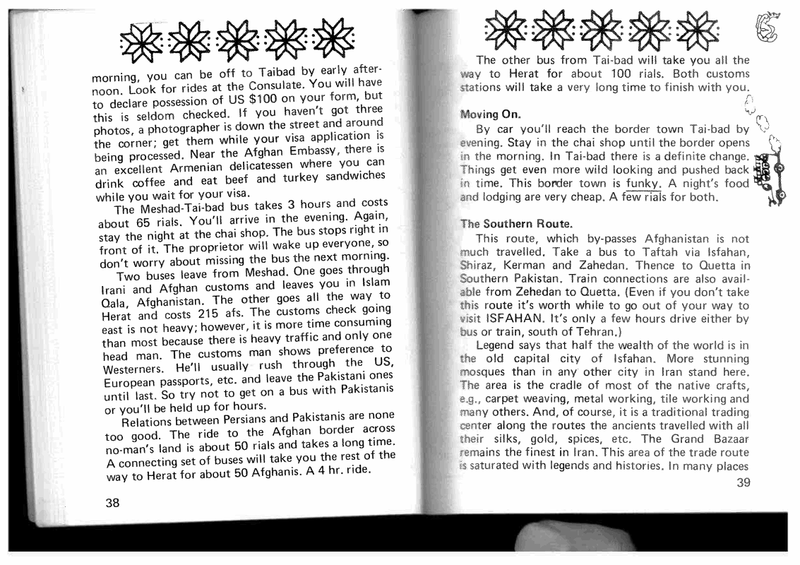 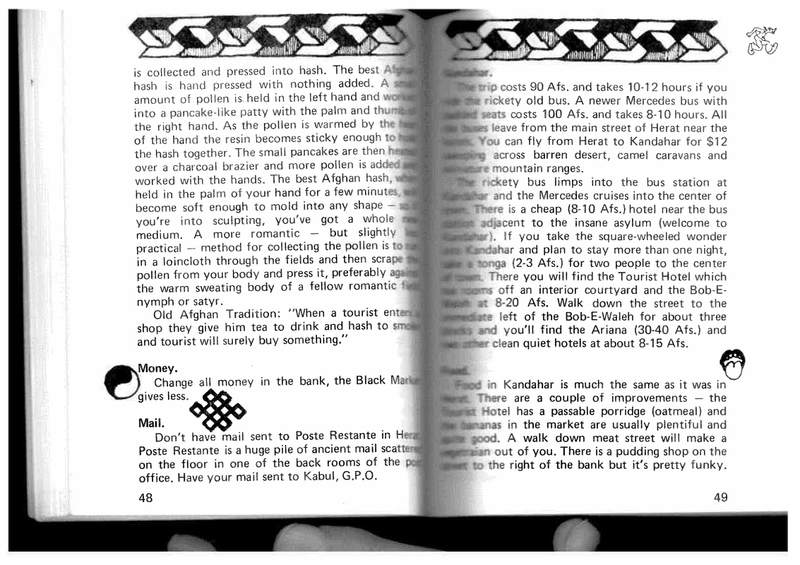 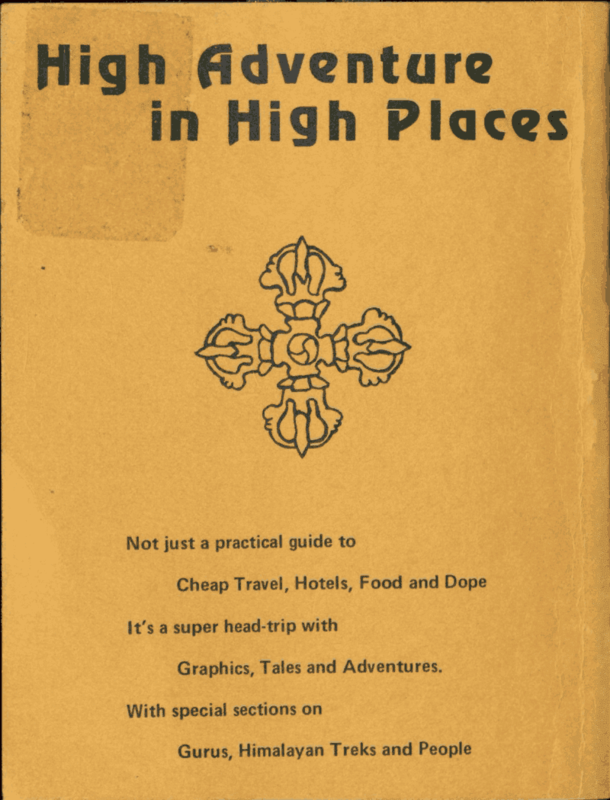 In the meantime, we're publishing some excerpts covering the Middle Eastern part of the trail from this 1973 travel guide. 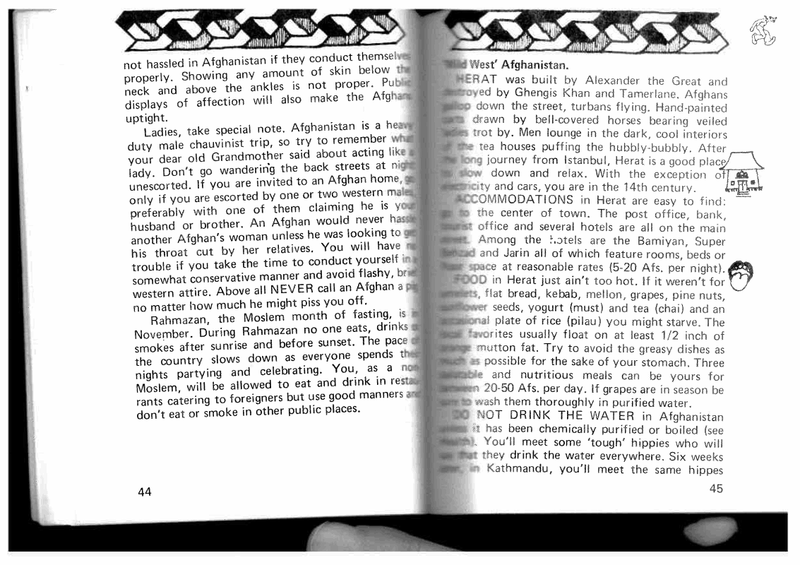 Many of us, I suspect, felt a certain disappointment on discovering after our first trip to the region that our grown up relatives already had considerably better stories about traveling there than we did. 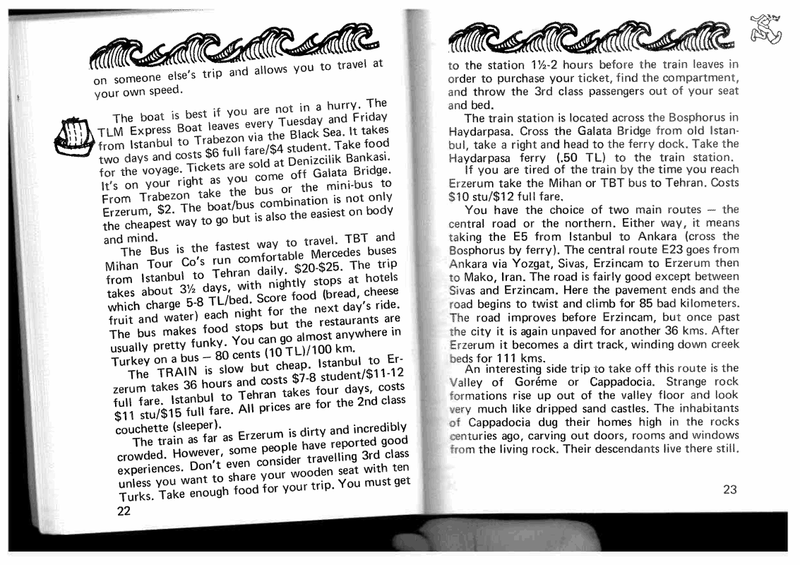 An aunt, for example, shared a train compartment on her first trip to Istanbul with a few Germans. 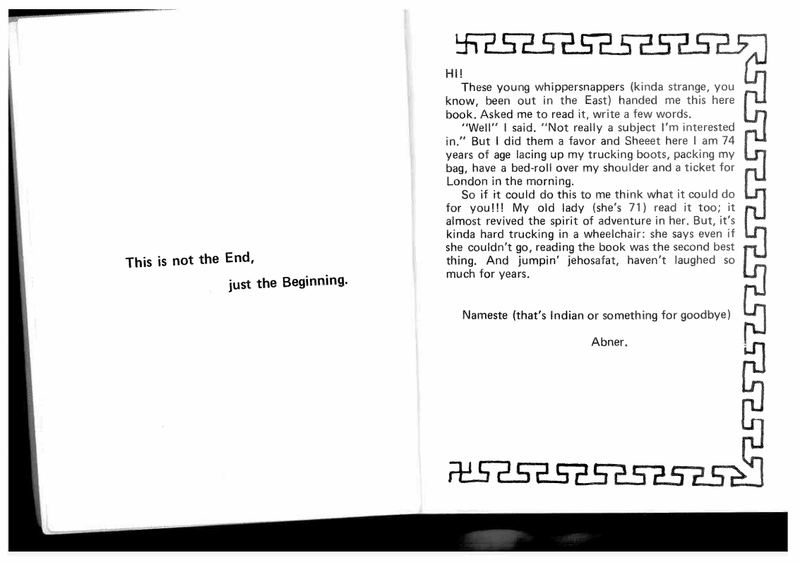 When they arrived in the morning the guy who had been sleeping in the hammock by the window was gone. 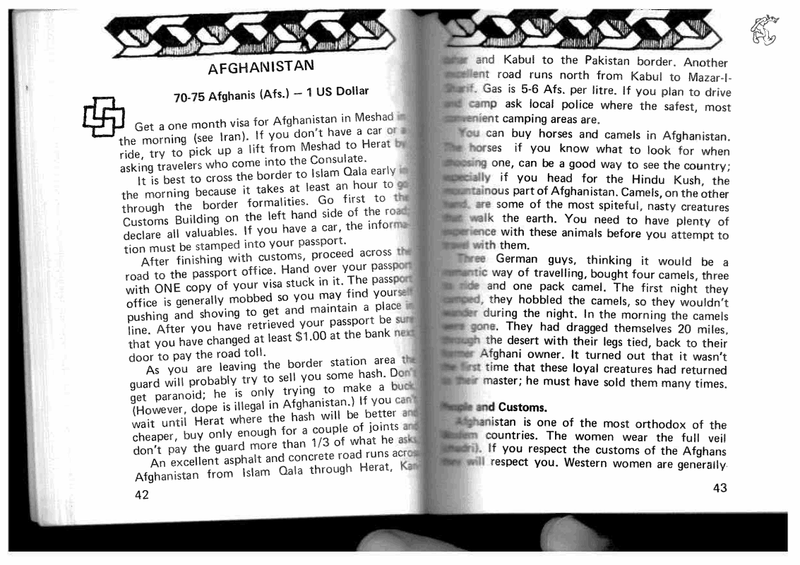 A few days later he showed up, saying someone had rolled him out of the window when the trains slowed to go through a town, taken his money and left him in a field by the highway. 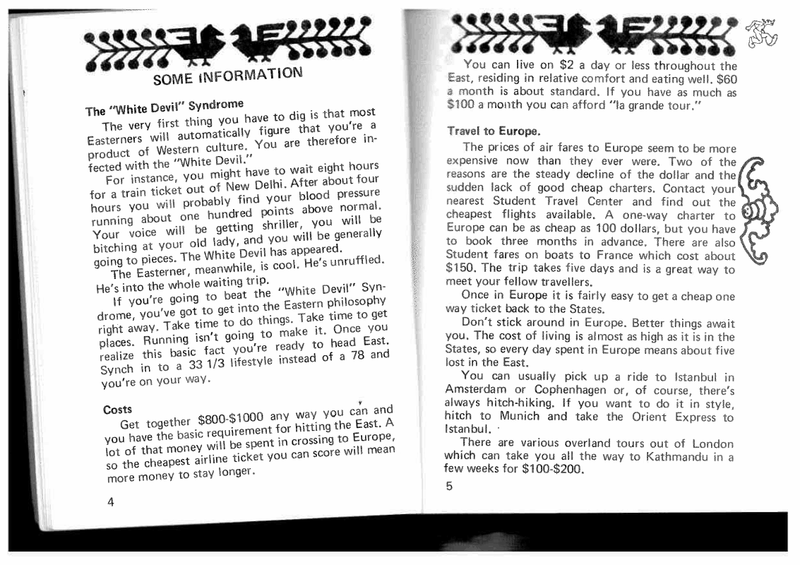 Now you can take the trip on a tour bus with a bunch of Australians. 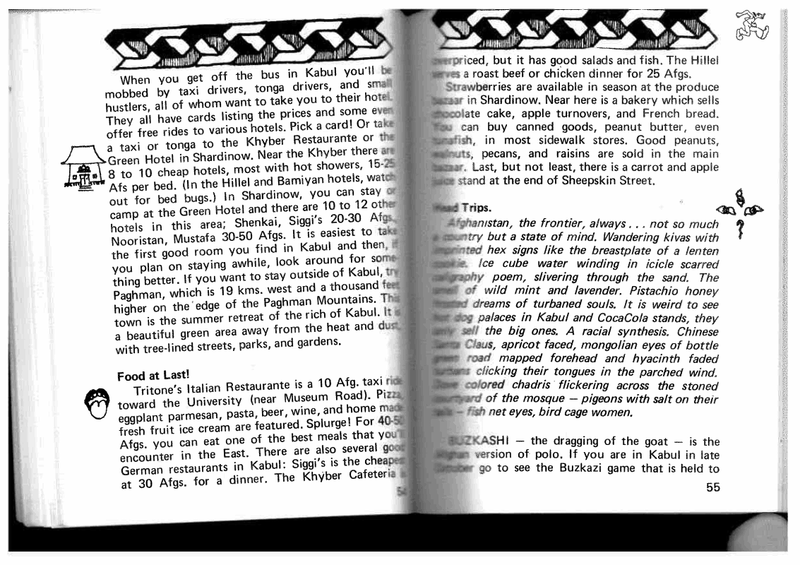 More seriously, though, for all of our discussions about the legacy of 19th century orientalism in shaping Western views of the Middle East, it seems worth considering that a particular view of the region that emerged in the 60s and 70s and is reflected quite clearly in this guidebook also influenced the way quite of few people now in positions of power first learned to see the region. 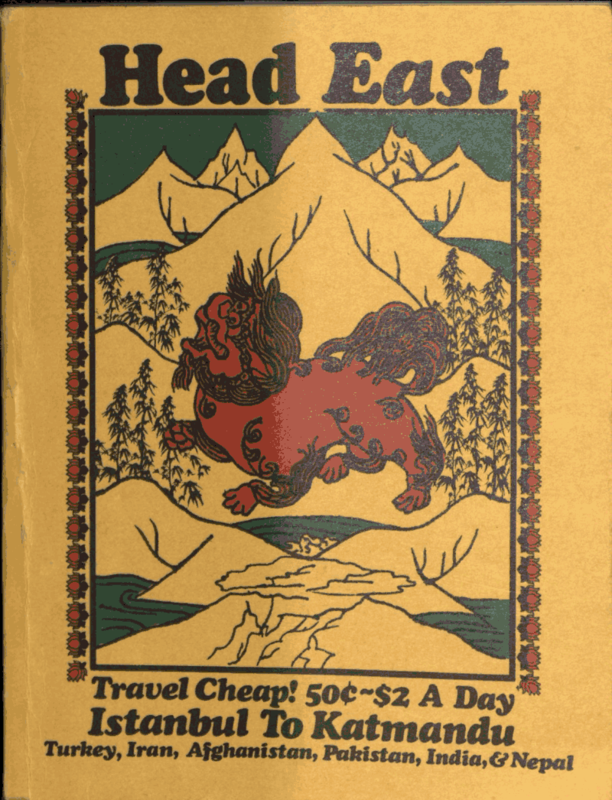 There's obviously a good deal of variety in how hippie travelers saw the regions they passed through, but it seems fair to say that in a lot of cases they simply took long standing stereotypes about the region and reversed the value judgements. 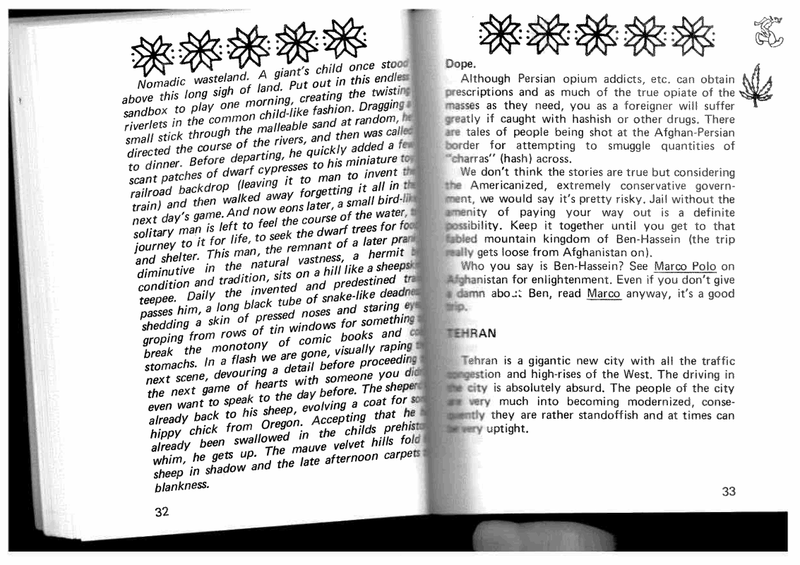 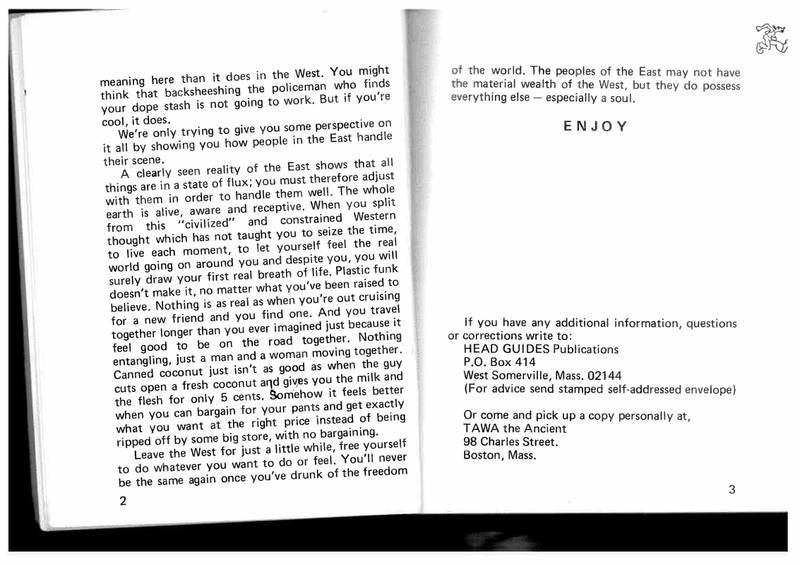 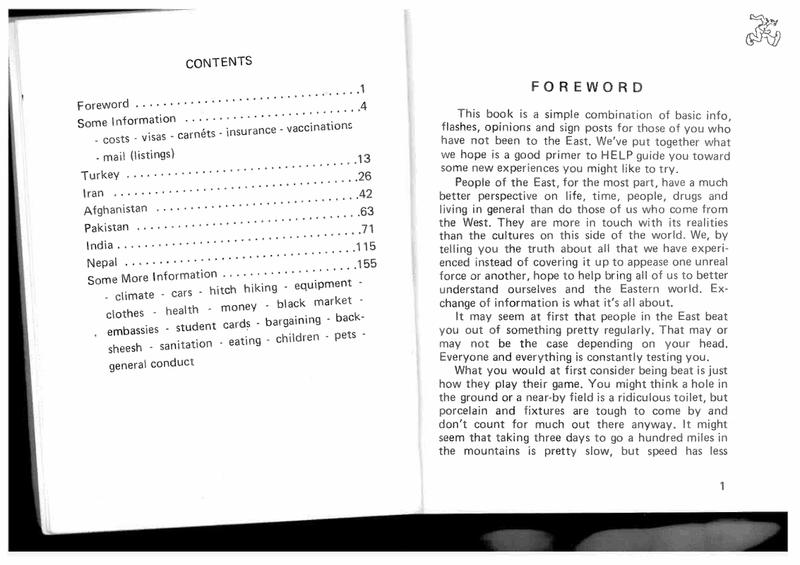 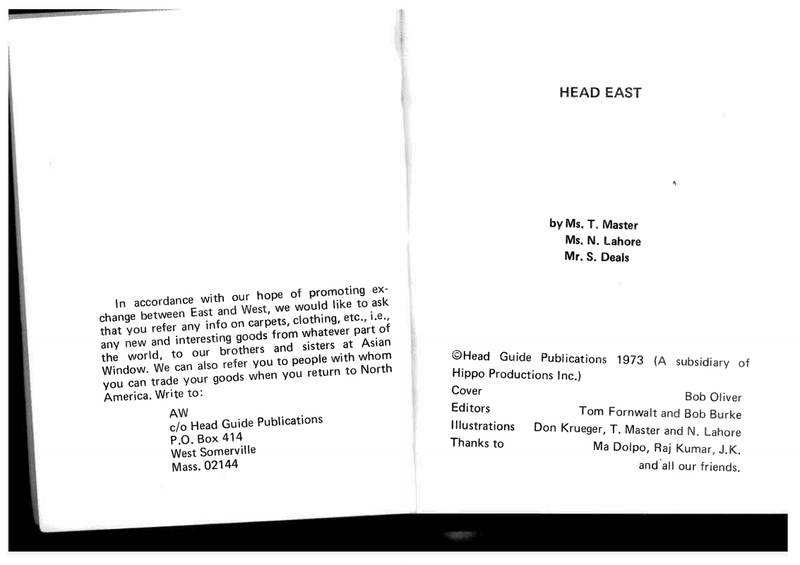 As the guide's introduction suggests, the East's lack of constraint, rationality and plastic materialism makes the Easterner more in touch with reality and gives him or her a better perspective on "life, time, people drugs and living in general."